A new Associated Students of the University of Utah (ASUU) presidency, senate and assembly have been sworn in for the 2018-19 academic year and are ready to serve all University of Utah students. Over the summer they worked with university administration to strategize ways to better serve the student body. The ASUU executive branch consists of elected officials President Connor Morgan, Vice President of University Relations Maggie Gardner and Vice President of Student Relations Xandra Pryor. Together they have appointed an executive cabinet, all of whom are responsible for a range of boards and committees. The executive branch is responsible for working with the student body to accurately represent, advocate for and provide support to all students of the university. 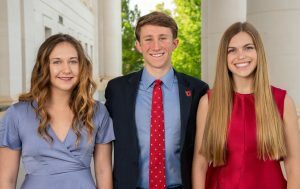 L to R, Vice President of Student Relations Xandra Pryor, President Connor Morgan, Vice President of University Relations Maggie Gardner. Advocacy: Being an advocate means reaching out across campus to determine where the needs are and then actively working to address those needs. It is the duty of ASUU to advocate for all students by working with the president of the university, the academic senate, the board of trustees, other university committees and units, and the state legislature to accomplish long-term sustainable goals. Safety: The safety of all students is a top priority for this new administration. One area of focus will be the U’s many parking lots that students access daily. While parking will never be free, the systems in place can evolve to meet the needs of the student population, especially related to late-night parking on campus. Mental health: It’s clear that mental health is a concern for all college campuses, and this presidency plans to carry on the work of the previous administration, which enacted a student fee to contribute to the campus Counseling Center. This fee will allow for more trained counselors to be hired and to extend the hours of operation of the center to better align with the need for these services. This administration plans to continue supporting and expanding the mental health fee. Bystander intervention: Prevention is the first and most important step to stopping crimes on campus, whether they be sexual assaults or other attacks on our student population. So, an educational campaign will be created over the next year to provide more bystander intervention trainings and diversity educations for the members of university clubs and organizations. Bystander intervention training empowers students to intervene in (and prevent) potentially harmful situations. Stepping in to assist another person who is experiencing harm or abuse is an important part of helping and supporting people in our community. Dream Center support: This year, ASUU has allocated $20,000 to support the campus Dream Center that supports our DACA students on campus. The Dream Center works holistically with undocumented students and their families from college access to graduation. This money is coming from ASUU directly and is a collaborative effort across all entities. This administration plans to continue supporting the Dream Center. Child care centers/student parents: Many students in the campus community are students with young and growing families in need of increased support. More lactation pods are needed as well as step stools at wash stations for small children to use. The university also needs to prioritize accessing federal grants and other funding sources to subsidize expensive child care services. Want to get involved? Check out open positions here. Or learn more about how to run in this year’s ASUU elections.